When I think of what the Bible refers to as a "nagging wife," I don't automatically consider myself one. I tend to place a "nag" on the same plain as a terrible, horrible, no-good, ugly woman who never has anything but vermin escape her mouth in the form of words. Terrible mental image right? I, of course, prefer to think of myself in a more pleasant light when it comes to the way I interact with my husband. Surely, ladies, I do not nag. While it's a very good thing that I have no trouble recognizing the ugliness of nagging, this week's focus really began my meditating on what a nag really is; by definition and from scripture. Ew... While I genuinely do not nag my husband anywhere close to "constantly" or "persistently," reading these definitions leads me to ponder how often (anywhere from a couple of times a week to a few times a day, depending on the surrounding circumstance) that I actually do exhibit said description. I found this disappointing, disheartening, and disturbing. Anyone else? 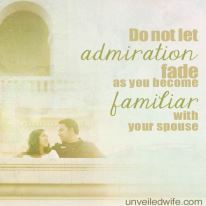 I desire to speak LIFE to my husband! To honor and appreciate him with my words and my TONE. We are not promised tomorrow. What a wonderful, meaty post, Rebecca. I need this reminder from time to time and I love all these scriptures. Thank you for linking up to Playdates with God this week! We have a no nagging rule in our house. I actually asked my hubby his definition of nagging to ensure that I didn't do it. I love the Challenge!! A great way to take the 'No Nagging in This Home' rule to the next level! Thanks. I was really encouraged by your post! I've featured it on Weekend Whatever Link Up - thanks for sharing!